This site contains original images and movies of the cell nucleus and the genome. Unless otherwise specified, this content was provided by the Michael Hendzel Laboratory. Dr. Michael Hendzel is an associate professor in the Department of Oncology at the University of Alberta. How to use this site:The links on the left highlight featured original content on this site. Clicking on the image will link to the corresponding page on this site. The links at the top of the page, just beneath the cellnucleus.com logo, provide access to the entire site. The educational link provides access to educational information contained on other related web sites. The structures link provides access to information about structures that can be found within the cell nucleus. These can also be accessed through either the electron microscopy or light microscopy pages. The image gallery contains featured images of the cell nucleus, the genome, and other structures found within the cell nucleus. 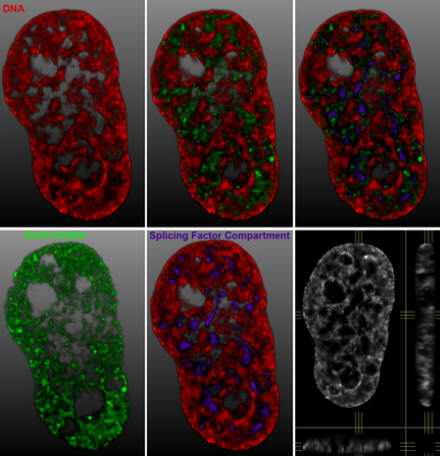 The movie gallery contains featured movies illustrating the 3-D structure of the cell nucleus and/or time lapse movies collected from living cells. Additional movies can be accessed through either the Structures or the Light Microscopy pages.